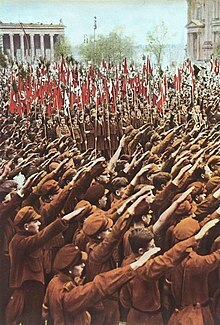 The Nazi salute or Hitler salute is a gesture that was used as a greeting in Nazi Germany. The salute is performed by extending the right arm in the air with a straightened hand. Usually, the person offering the salute would say "Heil Hitler!" (Hail Hitler! ), "Heil, mein Führer!" (Hail, my leader! ), or "Sieg Heil!" (Hail victory!). It was adopted in the 1930s by the Nazi Party to show obedience to the party's leader, Adolf Hitler. It also gave honour to the German nation (and later the German war effort). The salute was required for all civilians. It was mostly optional for military personnel who retained the traditional salute until shortly after the failed assassination attempt on Hitler on July 20, 1944. Use of this salute is currently a criminal offense in Germany, Italy, Japan, the Czech Republic, Slovakia, Austria and Uzbekistan. In Switzerland, France, Canada, the Netherlands and Sweden, the salute is illegal hate speech if used for promoting Nazi ideology. ↑ Kershaw, Ian (2001). The "Hitler Myth": Image and Reality in the Third Reich. Oxford University Press. p. 60. ISBN 978-0192802064. ↑ Büchner, Alex (1991). German Infantry Handbook, 1939–1945: Organization, Uniforms, Weapons, Equipment, Operations. Schipper Publishing. ISBN 978-0-88740-284-5. ↑ O'Dea, Claire (21 May 2014). "Hitler salute ruled not always illegal". Swissinfo.ch. Retrieved 27 May 2014. ↑ "Swiss court rules that Nazi salute may be 'personal statement', not racism". The Guardian. Geneva. Associated Press. 21 May 2014. Retrieved 27 May 2014. This page was last changed on 27 March 2018, at 22:17.